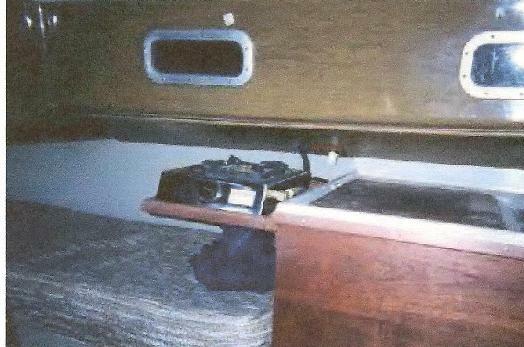 "Jim Huxford passed away on Sept 30, 2002 ..."
Jim was the owner of Ile aux Galet (aka "Ceiling Zero"), Yankee Dolphin #221. Her homeport was Boulder Yacht Club, Lake Carlyle, Illinois. Jim was refinishing her when he passed away. Here is a picture of her. "Calling all Dolphin sailers, past and present. Please contact us." 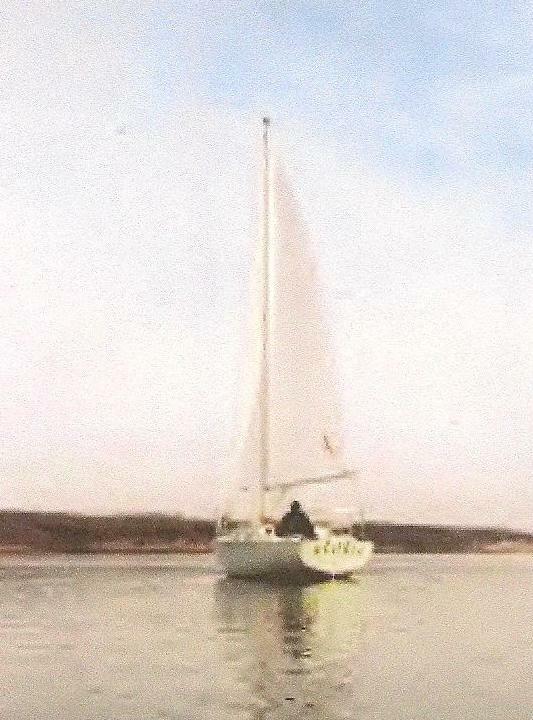 "Soundly built in 1971 by John Shoemaker (Shumaker) and the craftsmen at Yankee Yachts, including Bill Fodor, chief of production, she had been sadly neglected for years when we found her a few months ago. Restoration will be a big job but look at these lines!" We're renaming her for the island in the Nor'East corner of Lake Michigan just south of Grays Reef, and a memorable night during 1982 Chicago-Mac race. The name translates to 'island of pebbles' and for centuries has been locally pronounced "skilly-go-lay" (Rhymes with Silly-O.K.)" Below are 2 links to the part of Jim's site we found in the web archives. In them Dolphin owners may find their emails to Jim with questions about our boats and general Dolphin chatter. The following is from Good Old Boat August 1, 2003 Issue - Mail Bouy. First is a comment by Karen Larson, the GOB Editor, and then a letter from Jim's wife, Lyn. GOB Ed: After running a note in the June newsletter about Jim Huxford, who lost a fight with cancer, we received the following note from Lyn Huxford. 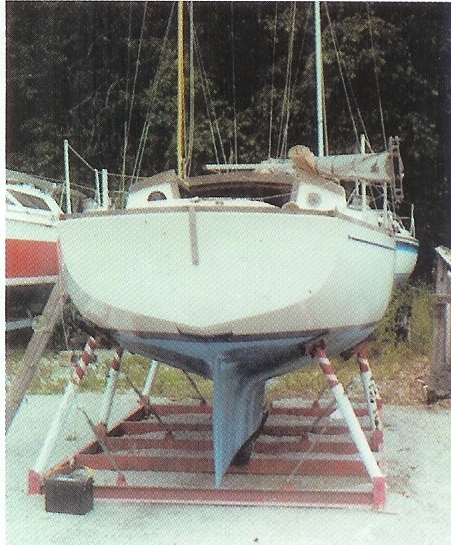 Jim managed a site for Yankee Dolphins and was refinishing his own 24-foot Dolphin. Thanks for sending us the nice note. 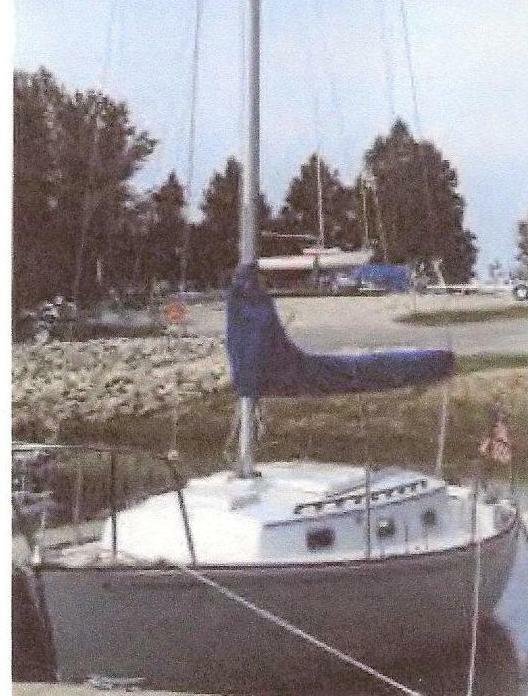 I am very interested in finding a good home for Jim's boat. It is currently setting on stands at the Boulder Marina. He had taken the cabinetry out to refinish, which he did, but the inside fittings are currently in my basement. I think he completed most of the repairs to the hull that he wanted to do. I really don't know what is a reasonable price in its current condition. It needs someone to give it a lot of loving care. I would like to get approximately $2,000 OBO, but I am not certain this is realistic. If you can help in any way I would greatly appreciate it. My email is ihuxford@mckendree.edu. Please pass it along to anyone who might be interested. Messages can be left at 618-537-6901. Thanks once again. Jim so much loved your magazine, and I as a fledgling photographer, was always in awe of the photography. The website is down, but I can't find Jim's backup file. I don't know how to pass it along to anyone, but I do have some of the printed Dolphin documentation he had collected that I would be glad to share. Webmaster Note: Early in 2007 when getting this website set up, this webmaster has tried to reach Lyn but no luck so far. We are still trying to find out what happened to Ile aux Galet. 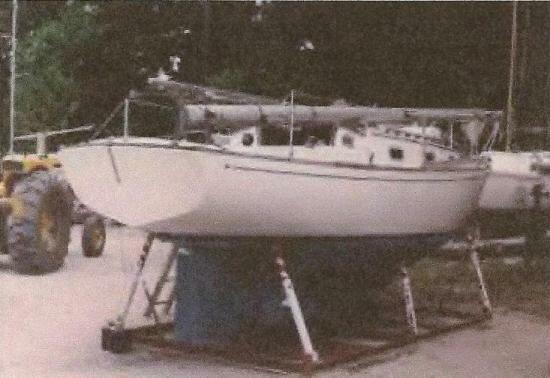 In October, 2007 she was spotted at the Tradewinds Marina in Keyesport, Illinois on Boulder Lake, and then she disappeared again. 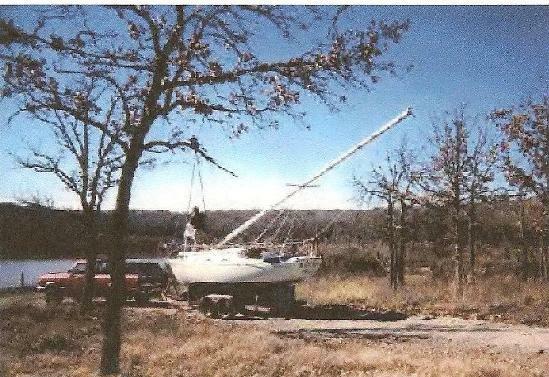 We did find some pictures on www.sailboatspecs.com - the first one below was the clue that we had found Jim's old pictures of his boat. These were scanned from downloaded pictures that were then printed so quality leaves something to be desired. Anyone who can firgure out the name on the transom 2nd and 4th pictures below, or from the website link, please let us know. Compare the cradle with the one at the top of the page - Bingo!! 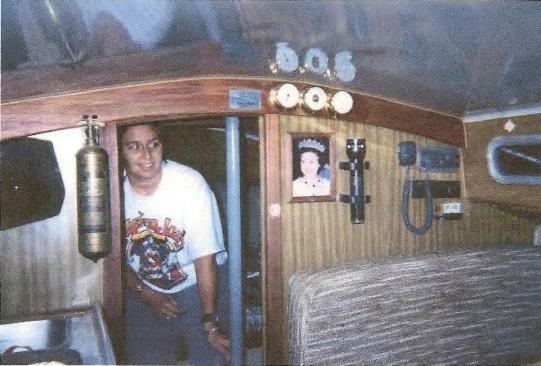 .The name on the transom (unreadable here) suggests that this was the name when Jim bought the boat and before he renamed her. Notice the scissors 'gin pole' and one? man operation.